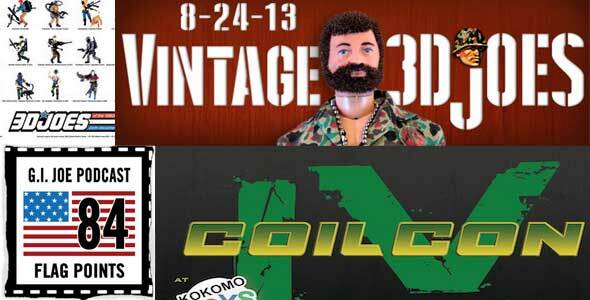 You are here: Home » Featured » 4 Reasons 8-24-2013 is HUGE for GI Joe fans! 1. 1 Year Anniversary of 3DJoes.com! Congratulations! Even if you aren’t a GI Joe fan this is a fun sight to check out all of the rotating views of all your favorite Joes. You might also remember 3D Joes from Joe Con this year. They were the ones that had the very cool posters of all of the 80’s GI Joe figures. If you weren’t there, I can tell you the posters are very cool, and everybody was talking about them. 4. Coil Con 2013! Last but not least, where I’ll be on the 24th, Coil Con in Kokomo, Indiana is the coolest Midwest GI Joe meet you can think of. With lots of “Joelebrities” in attendance, this should be something you should see if you can get there. If you want to get a taste of a Joe Con experience, this is the perfect opportunity. The atmosphere is laid back and friendly. There are people selling all sort of items, great customs, and everybody is talking GI Joe. Top that off with the fact that Coil Con is being held again at Kokomo Toys and your really have a can’t miss event. Kokomo Toys is worth seeing by itself if you are a toy collector of any sort. They will have something you want to buy. 8/24 is the date Wordburlar’s Cobra Island album hits too! !